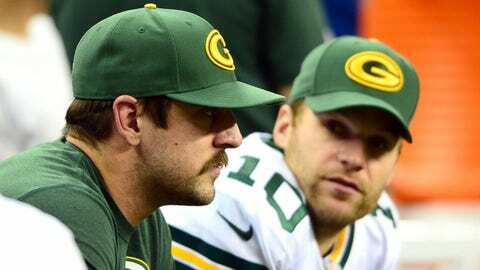 Packers quarterback coach Ben McAdoo (not pictured) has received strong support from Aaron Rodgers (left) and also helped mold backup Matt Flynn. A person familiar with the New York Giants search for an offensive coordinator says the team is set to interview Green Bay Packers quarterback coach Ben McAdoo on Monday. The person spoke on the condition of anonymity because the Giants have not revealed their list of candidates to replace Kevin Gilbride, who retired on Jan. 2. McAdoo completed his eighth season with the Packers, including his first six as the team’s tight ends coach. The 36-year-old has gained attention on the NFL coaching trail this offseason. Last week, he was interviewed by the Cleveland Browns regarding their head coaching job. McAdoo has received strong endorsements from Packers quarterback Aaron Rodgers and coach Mike McCarthy.